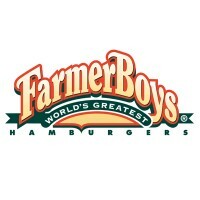 Farmer Boys is a quick-service restaurant chain that specializes in burgers made from farm-fresh, locally-sourced ingredients. Other products include bacon burritos, onion rings, salads, sandwiches, and desserts. Their headquarters is located in Riverside, California. The restaurant was founded by the five Havadjias brothers who were raised on a family farm and were known to family and friends as “The Farmer Boys.” They established the company in 1981. The chain currently has more than 80 franchise locations in California and Nevada. They have received several awards for their burgers, such as the “Best Burger” recognition from Inland Empire Magazine and from KCBS-TV (CBS 2). Farmer Boys provides their team members with comprehensive benefits package which consists of health insurance, paid vacation, sick leave, holiday pay, and 401(k) retirement plans. Employees also enjoy paid trainings and uniform compensation. The restaurant promotes a fun, energetic, and fast-paced work environment. If you’re passionate about farm-fresh food and want to learn more about the farm-to-table philosophy, you will surely enjoy working here. How old do you have to be to work at Farmer Boys? Job aspirants must be at least 18 years old at the time of application. Front-of-house roles include server, cashier, cook, and kitchen helper. Positions in the management will require previous supervisory roles. Server: Servers provide customer service to all diners by taking orders accurately, upselling specials, answering customer queries about the menu, and exhibiting excellent listening and communication skills when interacting with customers. Other tasks include pre-bussing tables, serving the customers’ orders, and engaging the diners appropriately throughout their shift. Cashier: A Cashier handles cash, utilizes POS systems, processes customer payments, and assists diners in food selection by explaining the menu. Cashiers greet customers upon entry and thank them upon leaving the establishment. As they are the first and last point of customer contact, they should possess strong communication skills and personable attitudes. Prep Cook: A Prep Cook begins the cooking process by preparing needed ingredients according to the restaurant’s specifications, weights, and procedures. They ensure correct sizing, portioning, and freshness of food items, and maintain cleanliness in the work areas. Prep Cooks should adhere to all food sanitation and safety procedures as directed by the Manager In-Charge. Line Cook: A Line Cook prepares meals and finishes the cooking process according to customer requests and cooking specifications. They ensure proper plate presentation and timely preparation of food. They notify the Manager in case the food items do not meet the freshness standards. They should also abide by all food sanitation and safety procedures as regulated by the management. Kitchen Helper: A Kitchen Helper provides assistance in the kitchen and around the restaurant. They retrieve the needed ingredients from the fridge or storage room, wash, peel, and cut food items, replenish the condiment bottles and shakers, mop the kitchen floor and sanitize the workstations to ensure cleanliness. Dishwasher: A Dishwasher makes sure all kitchen equipment and utensils are thoroughly washed and clean. They may be tasked to use mechanical dishwashers or wash by hand. They should follow all safety and sanitary guidelines as trained and directed by their superior. Host/Hostess: The Host/Hostess greets customers upon entering the restaurant, guides them to their table, and hands them the menu. If the customer has questions about the menu, the Host/Hostess should be ready with the right answers. They must interact with patrons in a friendly yet professional manner. Shift Leader: A Shift Leader is responsible for the efficiency and productivity of daily operations during their shift. They provide high levels of customer care and maintain overall cleanliness and appearance of the restaurant. Other duties include record-keeping, ordering and receiving needed supplies and equipment, inventory, cash management, and following and implementing proper sales procedures. Assistant Manager: An Assistant Manager supports the General Manager in accomplishing all managerial tasks. They contribute to the planning and execution of short- and long-term company goals to improve profitability. They take part in hiring, training, evaluating, and providing feedback to employees. They direct staff members through their daily routines to make sure the store runs smoothly and efficiently. General Manager: A General Manager leads the planning and implementation of strategic business goals of the restaurant. They actively participate in selecting, orienting, and training of new staff members, and take responsibility for the ongoing development of existing members. They oversee the day-to-day restaurant operations, ensuring effective productivity and profitability. Farmer Boys accepts both online and in-person applications. Candidates may visit their local restaurant to submit required forms. Be sure to turn in documents with current, complete, and accurate information. To apply online, applicants should go to the company’s official website and access the careers page where they can browse all available jobs and submit application for their chosen position. Entering incorrect or improper information in the forms may result in disqualification. As such, candidates should take time to proofread all hiring forms and check for any errors before submission. Resumes are also an important tool for hiring success. It should highlight the applicant’s achievements, skills, and abilities. Those with experience in the fast-food industry and customer service should also include the details in their CV. When attending job interviews, wear proper business-casual attire and display confidence and professionalism. Candidates expressing willingness to learn and strong interest in the farm-to-table concept of food preparation may gain good opinion from the hiring team. The culture of Farmer Boys values not only the customers but its employees as well. In fact, the restaurant chain has a history of awarding scholarships to their employees for their professional growth program. The company has been sponsoring the annual Children’s Day at Loma Linda University Children’s Hospital for 7 years. According to their February 2018 press release, the chain raised nearly $70,000 for the said hospital. Aside from their mouthwatering, farm-fresh food, Farmer Boys is also known for having a scarecrow mascot named “Straw Man” which they use in their advertising campaigns. The mascot wears a “farmer boy” overalls and driver’s hat. The restaurant has active social media accounts on Facebook, Twitter, and Instagram, as a way to connect with more customers and to hear about their thoughts and how their dining experience has been. 1 How old do you have to be to work at Farmer Boys?